Well, after 30 some-odd days, I am pleased with the final result. 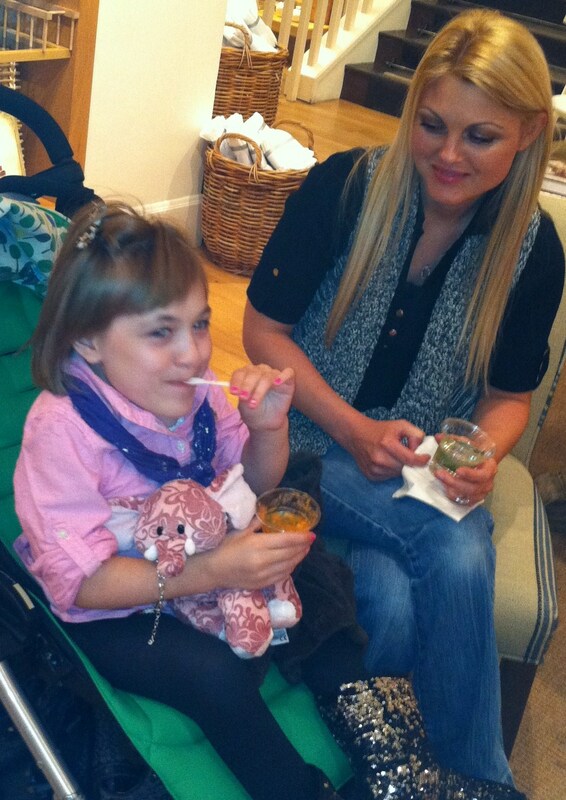 Even with all the tasting I do, sticking with my diet and NOT limiting myself to fad dieting like “no carbs, etc.” …. I managed to lose…. Drumroll, please. 24.4 lbs! Feel great and went down a size or more. Was it easy? No, but not as difficult as I imagined, even being surround by great food 24/7. I am planning another pop after our extremely busy holiday season. Thanks to all our customers who noticed! 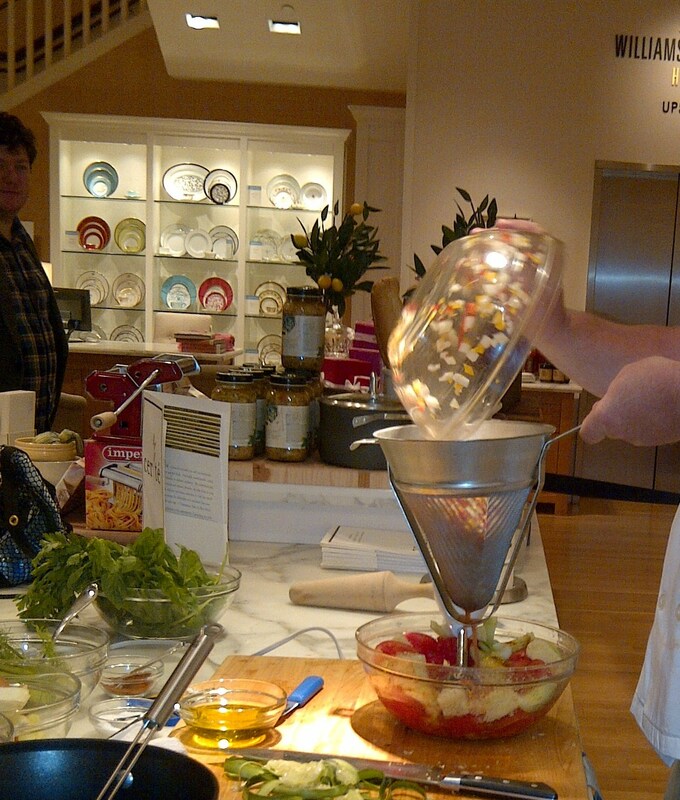 Chef Edward appeared at the Williams-Sonoma kitchen on Saturday, September 17 at Columbus Circle to show how to prepare a fresh, classic Gazpacho. Certes Gazpacho recipe is one our most requested and its not too late to add a healthy dose of fresh vegetables to your diet. Gazpacho is an ancient Spanish soup, is traditionally served cold and thickened with bread and olive oil. 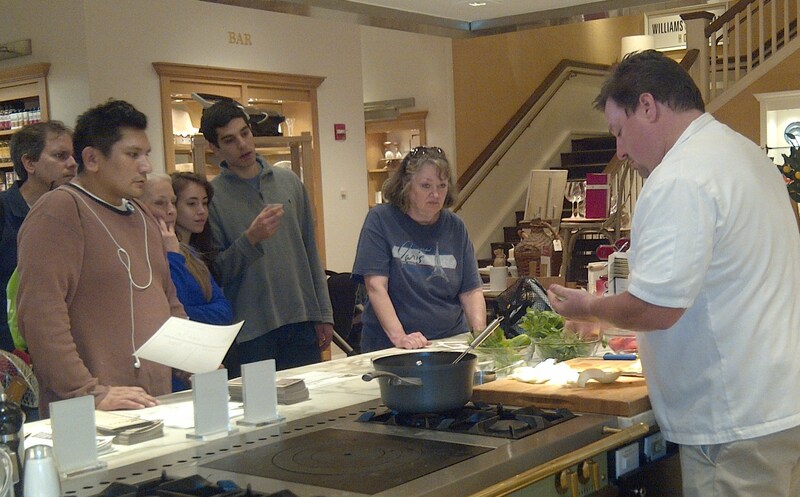 Chef Edward demonstrated the making of gazpacho to a rapt audience. Many were taking photos and notes. 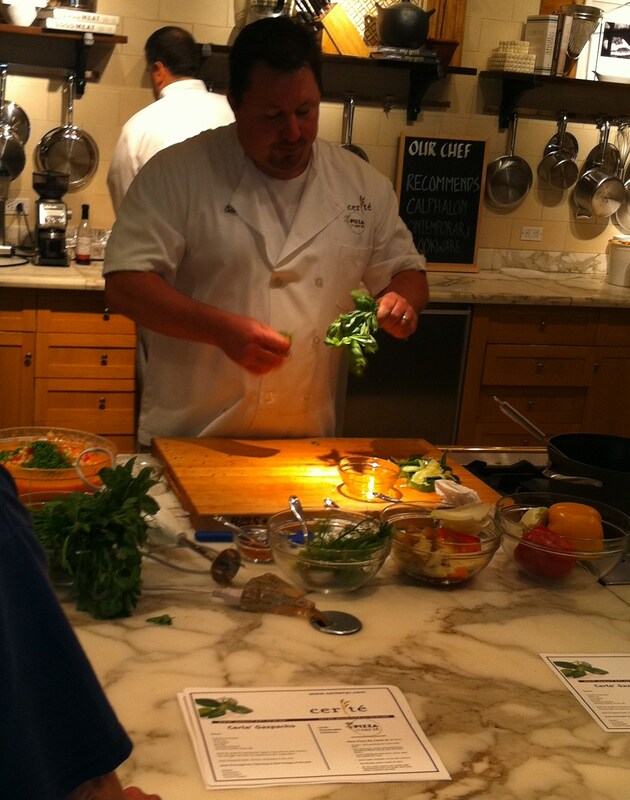 In the Live Chef Demo, guests learned how to whip up a healthy exotic dish with samples being quickly picked up along with a copy of the recipe. 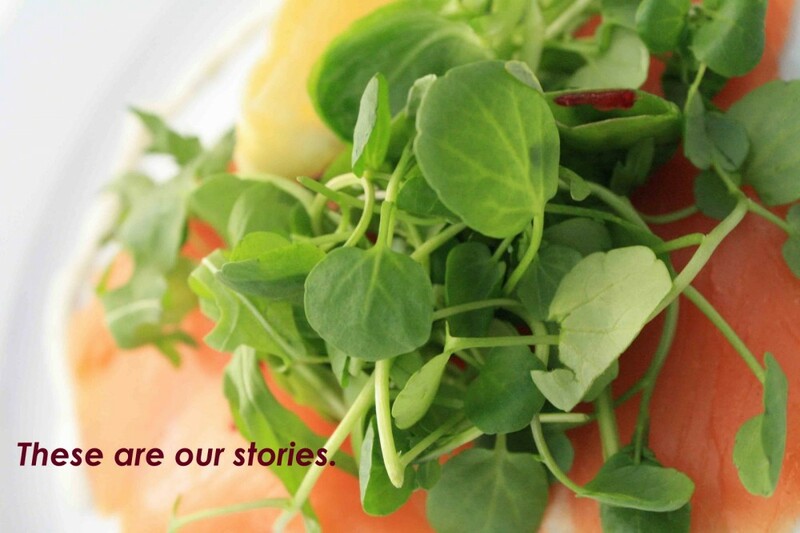 Expertly balanced and remarkably fresh is the only way to describe this dish. There were even a few children who loved the fresh version so dont count this out for your kids. Along with the demo, he also offered tips on professional techniques. Gazpacho can be any chilled soup made with seasonal ingredients, he said. He made a traditional Gazpacho, with tomatoes, peppers, fennel and cucumbers with a modest amount of Cayenne Pepper, giving the soup a little kick. 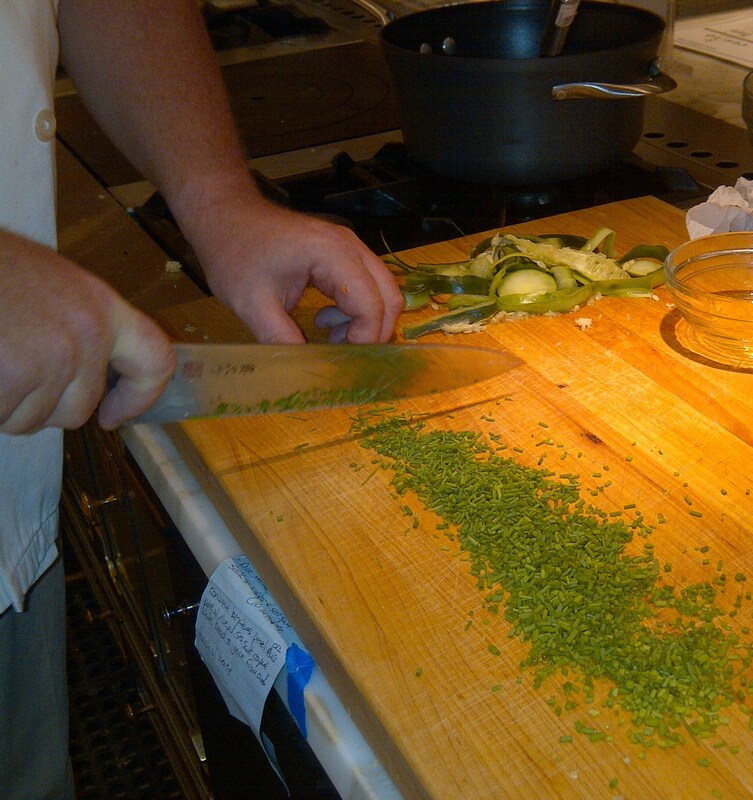 He removed the seeds of the peppers and cucumbers to improve the flavor. The mixture of chopped tomatoes, peppers, cucumber, fennel, basil needed to chill overnight before being pureed in a blender the next day, he said. However, he permitted the guests to taste the Gazpacho made the previous day versus the fresh one he had just made in front of the audience. We think the consensus was about 50/50 which one they preferred! He also mentioned the recipe can be used as a base for more creative concoctions. The soup can also can be garnished with anything from grilled Shrimp to Crème Fraiche. This dish goes along with Chef Edwards Slow Food philosophy to keep as much processed foods as possible out of your diet. This will keep in your fridge about a week. 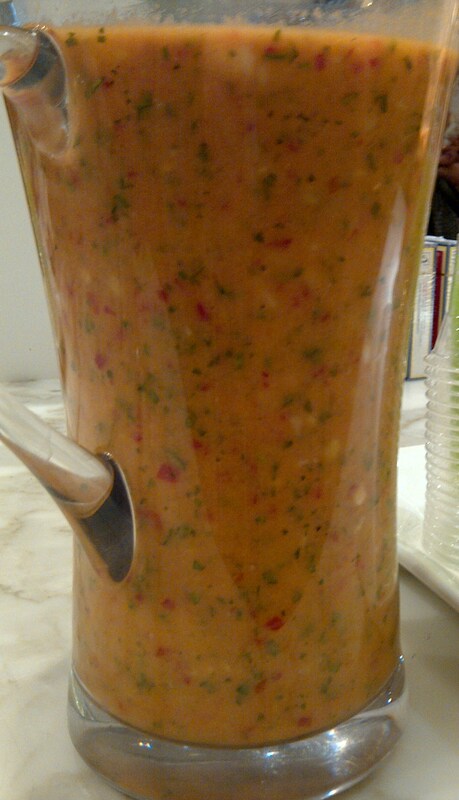 So, meet his Heirloom Tomato Gazpacho…..
We’re Taking the $5 Slow Food Challenge! We are taking back the ‘value meal’ by providing a slow food meal that costs NO MORE THAN $5 PER PERSON. Because Slow Food shouldn’t have to cost more than fast food. We’re sending a message that too many people live in communities where it’s harder to buy fruit than Froot Loops. The campaign’s been picked up by Time, ABC News, The Washington Post, The Chicago Tribune and 240 other outlets. There are 234 events registered, and over 4,700 people have pledged to share a $5 meal with friends and family. There’s a powerful story developing about people all over the country coming together to share simple meals and talk about what we can do — in our kitchens, in our communities, and as a country — to make good food a reality for everyone. Join us at both Certe’ and Pizza by Certe’. Check out www.slowfoodusa.org for more information on how you can help. All these menus have become so repetitive, I am boring my way to losing some pounds! I’m feel certain I’m boring you all too, so I will post in a few days the total results. Thanks to all you die-hards who have been following along! Lunch. Green Veggie Omelette (Broccoli, Asparagus & Spinach). Cottage Cheese over a Salad. Dinner (PBC). Meatball with Sautéed Spinach. Breakfast. Fruit Salad. Peach Ronnybrook Yogurt Drink (from PBC). Dinner (PBC). Pappardelle Al Forno with Cauliflower Merguez. Lunch. Chicken Broth and Sautéed Spinach.